Dido and Aeneas, presented by UCSB Opera Theatre. At UCSB's Lotte Lehmann Concert Hall, Wednesday, April 11. St. Augustine scolded readers for weeping for Dido when they should’ve been weeping for their own souls; but, he hadn’t seen the beautiful, pious, and devoted Dido played by Julia Teal Kermott in UCSB Opera Theatre’s production of Henry Purcell’s Dido and Aeneas. Granted, Purcell and Nahum Tate (the librettist) cleaned up Virgil’s Aeneid a bit, substituting a tasteful draught of poison for the famous self-immolation scene (among other things), but the real difference lies in the grace and beauty this ensemble brought to a 17th-century work. Steven Kronauer’s direction and conducting brought every line to life and Adam Phillips’s powerful, conflicted Aeneas helped us understand how Dido could feel so strongly for the man who abandoned her. 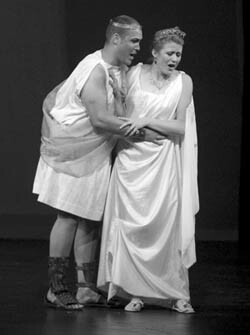 Adam Phillips as Aeneas (left) and Julia Teal Kermott as Dido. For an opera with a sad ending, the characters spend a lot of time rejoicing, as the chorus clearly showed us with brilliant songs of love. Christine Hollinger, as Dido’s friend Belinda, leads the way in encouraging the Queen of Carthage to give in to the charms of the Trojan prince, and all celebrate a wonderful wedding. Unfortunately, trouble is imminent. Kristin Williams, as the Sorceress, brews up misery by falsifying the message from the gods that will separate the two lovers. Williams dreams up her wicked plot with a glorious mixture of jealousy and outright malice, as her coconspirators-played with delicious glee by Allison Bernal, Amanda Morando, India Wallace, and Gabriella Goozee-Nichols-laugh wickedly at the impending destruction of the Queen and her realm. But what is there to do? Nothing really, and that’s the saddest part. Aeneas must obey, and Dido knows it. Even the sailors who begin the third act by joking about leaving their women behind end their song with sadness. In the end, the sorceresses’ delight in the success seems muted by the fact that they did not get to see their victims behave badly. Aeneas nearly defies the gods and stays, but then hardens his resolve; Dido tells him to go, even as her heart breaks; and the bitter reproaches in Virgil’s poem remain unsaid. As the perfectly balanced strains of Purcell’s music fade, we hear the sound of human passion coming to grief on the rocks of duty. And so we weep for poor Dido.